Add a custom Edge Finish to your business cards to complete your brand identity - It’s as easy as matching your logo! We have four exclusive options available so that you can find the perfect finish. Choose any color - CMYK, Pantone or even reference a color from your design. For an edge that packs a punch, make an impact with Fluorescent Edge Color! Available colors include neon blue, green and pink. Your Business Cards will shimmer with our range of Metallic Edge Finish colors. Dazzle your clients by adding reflective Metallic Foil Edges, available in stunning Silver, Gold, Copper and Black. It was a great honor working with Jean Jullien on these unique hand shaped business cards. This piece features 2 letterpress colors and is finished with black edge coloring. What stocks are Colored Edges available on? We recommend thick stocks for colored edges. Our thicker stocks provide a larger surface area to make your coloued edges really stand out. For a high impact, we recommend a stock that is 20pt thick or higher; however, the minimum we can apply edge color to is a 16pt stock. Edge color is only available on smooth uncoated stocks and stocks with a Silk Matte Laminate coating. It also cannot be combined with some print processes such as embossing, debossing and custom shaped (die cut) products. At this time, edge color is only available on square-cut products (e.g. rectangle or square) as small as 3.5" x 1.75", and some prints with rounded corners. We cannot apply edge color to business cards that have a 1" radius rounded corner on both top and bottom corners of the same side - e.g. Top and right and bottom right. For photos of our colored edge business cards, see the Inspiration section of our Colored Edges business cards page. See: What edge colours are available? Colored Edges, also referred to as Edge Finishing, are an add-on feature where ink is applied to the edge of your product. Available in 4 types: Custom (CMYK/Pantone), Fluorescent, Metallic and Foil; the addition of an edge color will make your prints more stylish and definitely stand out from the rest. These are perfect for business cards or beautiful wedding invitations! What types of Edge Finishing do you offer? We offer 4 main types of Edge Finishing: Custom (CMYK/Pantone), Fluorescent, Metallic and Foil. For maximum impact of the edge finish, we recommend selecting a thick stock uncoated stock such as our Cotton stocks or 28pt Uncoated. Below you'll find a list of colors we have available for each of these finishes. With this option, you may supply a custom mix of CMYK or a Pantone color. Alternatively, we can try to closely match a color in your design. For this option, you will need to leave a comment about the special instruction, before you finish uploading your print-ready files to your print order. This way, our Prepress team can provide an appropriate online PDF proof. Please allow for up to 10% of color shifting. These colors have a sparkly, glitter-like look and offer a subtle punch! 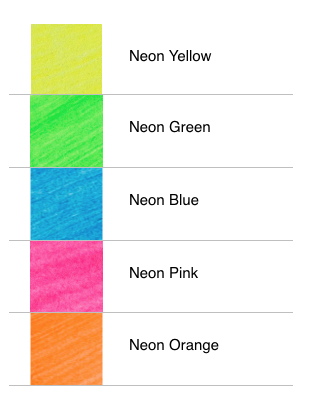 See our Fluorescent & Metallic Edge Finishing color references here. What is the difference between Foiled Edges and Colored Edges? Foiled Edges offer true metallic colors that are reflective and shiny. Available colors are silver, gold, copper, black, rose gold and bronze. Colored Edges are a bit more flat, but are offer a wider range of colors. You may supply a Custom (CMYK/Pantone) or choose from a selection of Fluorescent and Metallic colors. See: What types of Edge Finishing do you offer? The main difference between our Foiled Edges and Colored Edges is that the latter uses ink, and the former uses actual foil material. *Specs from the edge color may fall out on the 18pt Black Suede and 24pt Smooth Suede stocks. **Not recommended for 100lb Pulp. We recommend foiled edges on our ultra thick stocks like Bamboo or Cotton for maximum impact. Foiled edges also make prints look more formal and is a great addition for special occasions such as for wedding invitations. See: What edge finishes are available? To learn more about each type, see: Types of Edge Finishes. Please note that we do not have samples of all the possible options, especially CMYK/Pantone as these are custom mixed, and can only provide samples based on availability. Samples of select Edge Colors are available by ordering a Specialty Sample Pack. Although colored edges is available on a range of stock thicknesses, it will be more impactful on on stocks that are 16pt or thicker. Additionally, using bright and bold colors will be more visible, so make sure there is a noticeable contrast between your edge color and the surface of your cards. Colored edges is not available with embossed products. However, it possible with debossed and letterpress products, when the debossed / letterpressed artwork does not reach the edge. As this combination is considered a custom product, please submit a Custom Quotation form and a member of our Print Estimations team will provide you with a quote and further assist you with ordering.